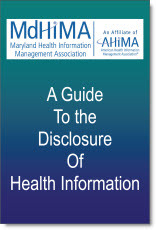 MdHIMA is proud to announce the released latest version of A Guide to the Disclosure of Health Information. The revised MdHIMA A Guide to the Disclosure of Health Information is THE resource for anyone dealing with disclosure of health information in Maryland. All health information management departments should have this reference guide! This publication is a rewrite of the 2001 edition. With the assistance of an attorney, every chapter was reviewed and updated to include current Maryland statutes and regulations. In addition, this latest version will provide a comprehensive resource that combines requirements of Maryland law with HIPAA Privacy requirements. This must have manual will outline the pertinent disclosure of information state statutes, includes HIPAA Privacy mandates and encourages uniformity in the processing and release of health information in the state of Maryland. The 2008 version will include copies of regulations and sample documents. Note: A Guide to the Disclosure of Health Information is to be considered a general reference to assist health information management professionals with legal issues regarding the disclosure of health information. It is NOT intended to be considered legal advice. Price includes shipping and handling for the CD. Price does not include the 6% Maryland sales tax if your billing address is in the state of Maryland. CD Version -Please allow up to 3 weeks for shipment after receipt of payment. Download Only -Access instructions will be provided within 2 business days from receipt of payment.